Door County Bakery is looking for cooks and other kitchen help, as well as servers to join our friendly staff in a fun, active environment. Summer and year-round positions available. Inquire by phone or in person. 10048 State Hwy. 57, Sister Bay, WI. Kept in storage every winter since 1995, this 1992 classic Buick Roadmaster is in beautiful condition with only 82,500 miles to the road. With an eight cylinder 350 cubic inch engine, this car gets 25-27 miles to the gallon (premium by choice). See it now in the Door County Bakery parking lot. I AM A 1992 8-CYLINDER-350 BUICK ROADMASTER; ONE OF THE LAST GREAT AMERICAN MADE AUTOMOBILES IN MY CLASS. I REALLY SHOULD HERE-TO-FORWARD BE OWNED AND ENDEARED BY A CARING CAR COLLECTOR. I’VE ALWAYS BEEN GIVEN PREMIUM GASOLINE WITHOUT ANY ETHANOL AND I PURR LIKE A CAT - CRUISING BARELY 1400 RPM @ 70 MPH; RUNNING AT NEARLY 28 M/P/G ON THE OPEN ROAD. I CAN GET-UP AND GO LIKE A SQUAD CAR IF YOU SAY “GO!" MY OWNERS DON’T REALLY WISH TO LET ME GO, BUT THEY FEEL IT’S PROPER TIME FOR ME TO HAVE A PROUD FUTURE IN KNOWLEDGABLE, SAUVY HANDS. …THEY ALSO OWN THE DOOR COUNTY BAKERY. Bernd Schell of Bamberg, Germany visited the Door County Bakery and took a Corsica Loaf home to Bavaria to be enjoyed with his friends. Bernd is in the automotive industry and travels the world. He was so impressed with the Corsica Loaf that he had to take one back to Germany. So now, the Corsica Loaf is an international favorite, too. 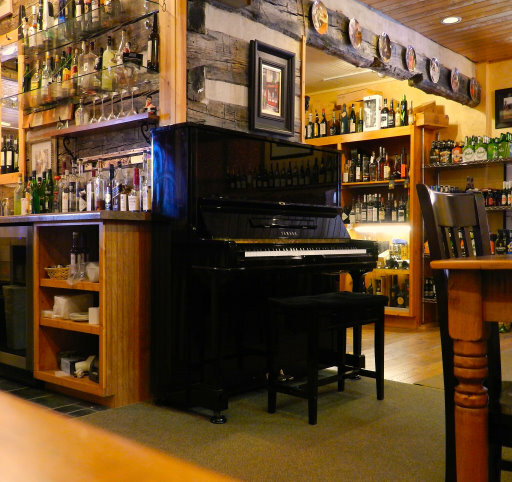 The latest addition to the Door County Bakery is this beautiful Yamaha upright piano. Don and Jean have added the piano to the ambiance of the bakery. It's sure to be played in the future, but for now, we can all enjoy its place in the Door County Bakery. 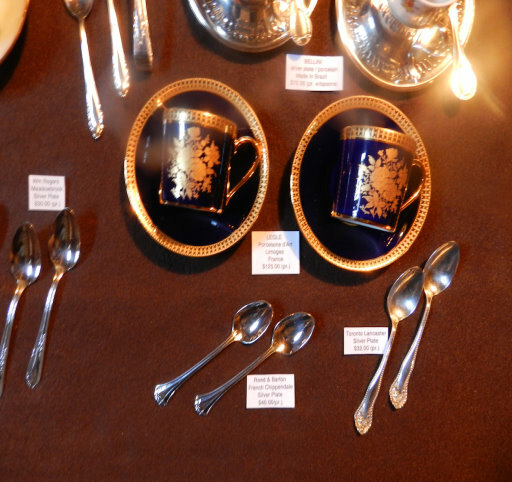 Recently displayed in the Door County Bakery, and perfect as a gift, is a collection of demitasse porcelain and silver. The Door County Bakery's Don Thompson collected these items over the years at estate auctions. A limited number of copies of "Jupiter," Don Thompson's first album recorded in 1975, are now available for sale at the Door County Bakery. 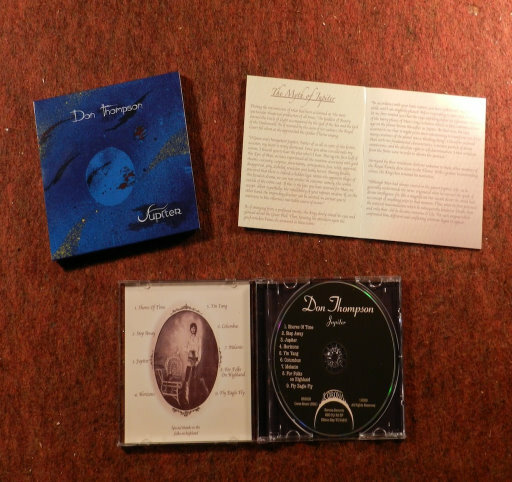 The Karona Records CD presents a myth and lyric which metaphorically addresses man's origin and destiny. This collector's item is available at the Door County Bakery for $10.00. There will be a charge for shipping and handling if you order the CD by phone. Don and Jean say that hardly a day goes by before someone will come into the bakery and tell them about the Door County Bakery commercials they heard on WGN Radio in Chicago. The commercials they remember were performed by popular morning host Spike O’Dell (behind the mic) and his newsman Tom Petersen, who for years talked about the wonderful products at the Door County Bakery. Spike and Tom have since retired, but their many loyal fans remember the commercials. 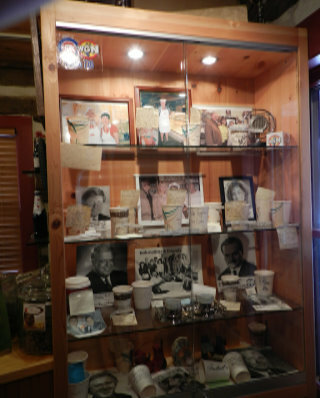 A portion of the Spike O'Dell coffee cup museum is now located inside the Door County Bakery. Previously located in the bakery's Back Door Studio, the cups and pictures are now more prominently displayed for all to see. The display harkens back to the days when Spike hosted the morning show on WGN Radio. The cups were signed by special guests who appeared on his show over the years. The pictures are of many of the personalities who worked with Spike at WGN. Old friends and customers of the Door County Bakery will remember "Wolfie," the Thompson's long time canine companion, who passed away a few years ago. 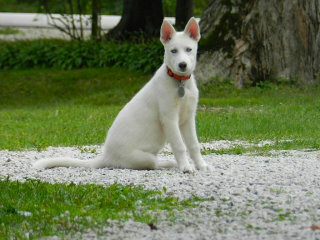 Well, Don and Jean now have "Wolfie II," a pure bred Siberian Huskey, to keep them company. This bright and happy dog will be seen occasionally roaming the grounds of the Door County Bakery, but she's more at home chasing squirrels at the Thompson's home in the woods.